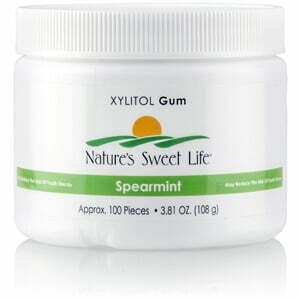 Nature’s Sweet Life Xylitol Gum freshens breath, cleans teeth and promotes dental health with all of the flavor and none of the harmful effects of sugar-laden gum. Chewing gum after a meal stimulates the production of saliva, which washes the teeth and neutralizes harmful acid produced by bacteria. 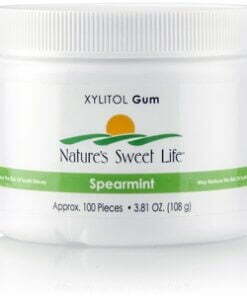 Regular use of xylitol has been shown to help reduce dental plaque–the first stage of cavity development, tartar formation and tooth staining–and promote better oral health.Nature’s Sweet Life Xylitol Gum contains xylitol, gum base, natural flavor from either spearmint oil or cinnamon oil, vegetable glycerin, gum arabic, soy lecithin and beeswax. Chew after or between meals to freshen breath and promote oral health. Xylitol, gum base, natural flavor (spearmint oil), vegetable glycerin, gum arabic, soy lecithin, and beeswax.